Today I have a secret recipe for a fantastic panini served at Panera Bread. Thinly sliced beef served with pickled red onions, Vermont white Cheddar and horseradish sauce all grilled on Ciabatta bread. The pickled red onions and horseradish sauce bring bold flavors to this sandwich. Slice onions as thin as possible, I like to use the 1/8 inch setting on my mandolin. Place the onions in a glass far. In a small bowl combine white vinegar, sugar, salt, and warm water. Stir until the sugar and salt are dissolved. These should rest about 30 minutes for using. Split the ciabatta loaf open, spread the horseradish sauce onto the top inside of the split loaf. Add roast beef to the bottom. Add the pickled onions, and cheese. Place the sandwich in the press, and cook about 3 minutes or until the sandwich is heated through. If you do not have a panini press you may want to use a grill pan, and a heavy object to press the sandwich into the pan. Some people like to wrap a brick with foil and use this as a press. Today I have a secret recipe for some yummy blueberry superfood muffins served at Panera Bread. These muffins are loaded with quality ingredients and of course a healthy amount of blueberries. To make these muffins even more super, add 2 tablespoons of heart-healthy chia seeds along with the walnuts. Discover The 10-Minute Paleo Breakfast! Heat the oven to 400°F. Coat a 12-cup muffin pan with cooking spray. Buzz the oats in a food processor until ground to the texture of coarse flour. Transfer them to a medium bowl and stir in the 1 cup of flour; the cornmeal, flaxseed meal, baking powder, and salt; and 2 tablespoons of the sugar. Set the flour mixture aside. Combine the walnuts, the cinnamon, 1 tablespoon of the oil, and the remaining 2 tablespoons of sugar and 1 tablespoon of flour in the food processor; grind with short pulses until coarsely chopped. Set the nut mixture aside. In a small bowl, stir together the egg, buttermilk, applesauce, and remaining 2 tablespoons of oil. Add this to the flour mixture and stir briefly. Fold in the blueberries just until the batter is moistened (a few lumps will remain). Spoon the batter into the prepared muffin cups until each is two-thirds full. Sprinkle the nut mixture over top. Bake until the tops are lightly browned and a toothpick inserted in the center of a muffin comes out clean, 15 to 20 minutes. Cool the muffins in the pan on a rack for 10 minutes. Remove them from the pan to cool completely on the rack. Today I have a secret recipe that will show you how to make Panera’s macaroni and cheese at home. 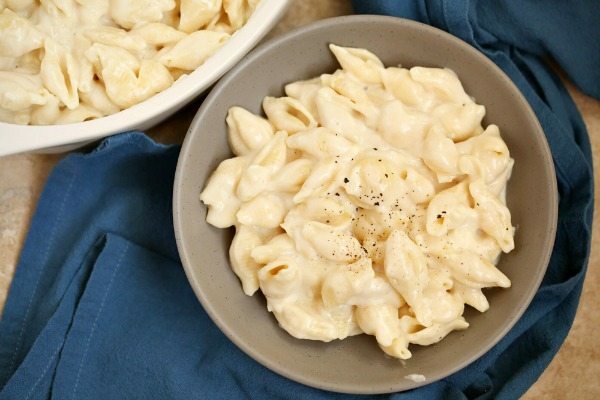 Pasta shells are tossed in a rich white Cheddar based sauce to create an incredibly satisfying dish. A hint of Dijon mustard gives a wonderful flavor to this pasta dish. This works as both a side and a main dish. In a four-quart non-stick saucepan over medium high heat, place dry pasta, milk, salt, and mustard. Bring to a simmer, stirring frequently over medium low heat until pasta is cooked and sauce has thickened, (about 20-30 minutes). Remove pan from the heat and stir in the butter and cheese. Garnish with parsley and serve immediately.